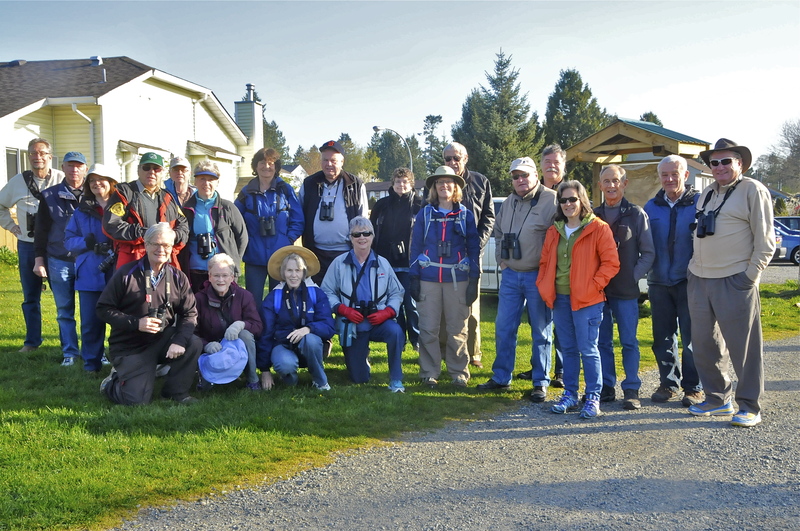 At about 8:20 on that glorious Wednesday morning, twenty-one birding brigade members assembled in the Langley parking lot for an outing around Brydon Lagoon and through Hi-Knoll Park. While waiting for the masses to arrive, several early birders surveyed the muddy little pond adjacent to the parking area but saw only a few Green-winged Teal floating about next to a discarded tire. However, a male Common Yellowthroat was observed and photographed in a small roadside tree. 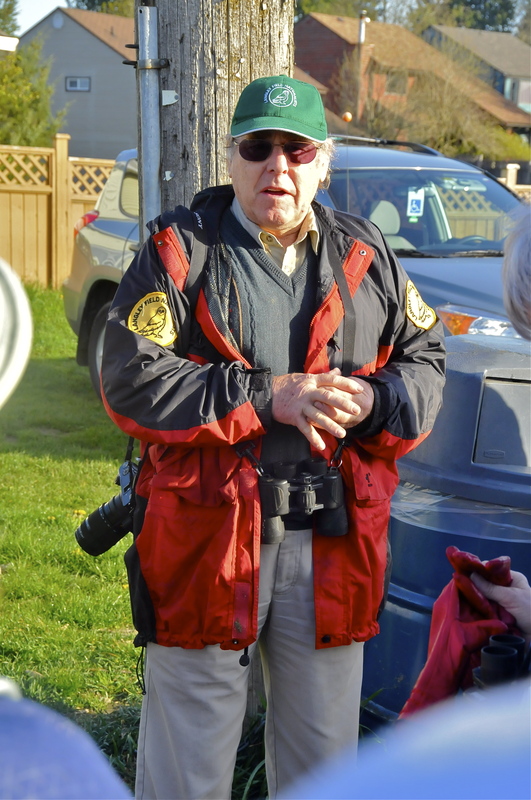 Langley Field Naturalists’ President Bob P. informed those who would listen that prior to 1960, when Langley was connected to the MV sewer system, the Lagoon served as the City’s sewage settling pond. After that, it languished as a swampy area until LFN in the 1990s took steps to reclaim it for nature. A setback occurred in August 2014 when an unusual hot spell together with an oxygen depletion caused by a low water level resulted in a disastrous fish kill (see Langley Times article). After the obligatory group photo was taken, the 21 participants proceeded to the main lagoon which appears to have recovered fully from the calamity. Squadrons of almost domesticated Mallards including an intergrade male were waiting for a handout, and other waterfowl observed included many Coots, several Buffleheads, Gadwalls, Common Goldeneyes, Pied-billed Grebes, a couple of Hooded Mergansers, Pintails and one Scaup. A log in the middle of the pond served as a perch for three disparate twosomes – a pair of Mallards, a couple of Glaucous-winged Gulls and a duo of Red-eared Sliders. Also sighted were latecomers Pascale and Alberto, newbie Laurie K. from the far east of Langley and – need I say it – the routinely unpunctual Otto, bringing the total to 25 trippers for the day. Perhaps listing those appearing in the group photo is now called for, lest they be disappointed. Camerists Marion, Roger, Terry, Glen, Liz and Ken with Anne were in the picture along with Kirsten, Kathy, Lidia, Langley’s Bob P. and Anne G., newshow Laurel A., Rob & Marylile, Gerhard, Mike, John, Tom, Wayne and I, the lone individual from White Rock/Surrey. and a number of prattling Marsh Wrens. Both Rufous and Anna’s Hummbug males were flashing their colourful uppers while buzzing about along the trail and later in the park. Three species of raptors were sighted – a soaring Harrier, a perched Red-tailed Hawk and the resident pair of Bald Eagles on and near their enormous nest in the tall Poplar. The large moss-encrusted Oregon Maple and adjacent trees next to the small parking area at the entrance to Hi-Knoll harboured both kinds of Chickadees, several Bushtits, an Orange-crowned Warbler, and “Hairyette” the Woodpecker. In the Park and in the forest west of the hydro lines, members of the troupe heard, and some even got glimpses of, the other two Wren species, a Downy and a Pileated Woodpecker, a Raven as well as a Kingfisher. However, what most attracted the photoists and delighted everyone’s sense of sight were the target wildflower species, the exceedingly rare Fawn Lilies, which are said to grow in only a few locations on the BC mainland. Both the white and the rarer pink species were in full bloom, and there were other blossoms such as Trillium, Scylla and wild Bleeding Heart to admire. After the uneventful walk back down from the knoll through the bog area to the Lagoon, it was decided to look for Wilson’s Snipes encountered on a previous occasion near the Bald Eagles’ nest. Although that quest did not meet with success, everyone agreed that it was another fabulous DNCB outing. After all, the weather had been excellent, the wildflowers were gorgeous, the scenery was great and roughly 40 avian species had been seen and/or heard. 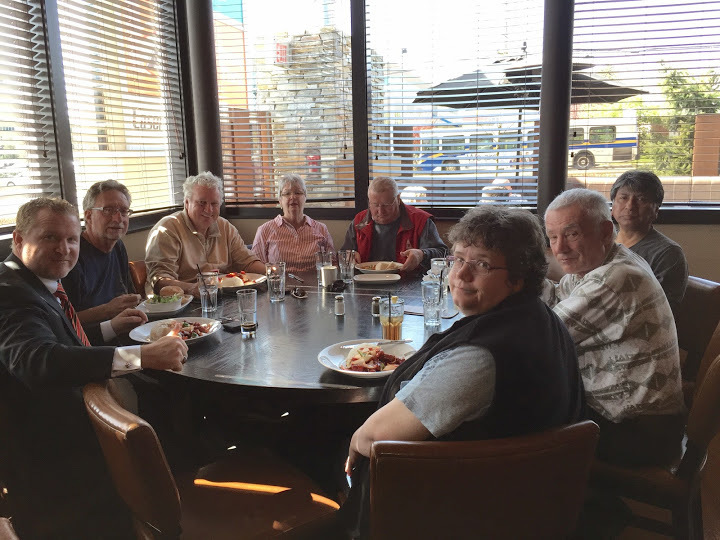 As a finale to a great day, several participants decided to have lunch and probably a barley beverage at Big Ridge Pub in Surrey. They then visited the family of Great Horned Owls residing near Tom’s home in Ladner. Photos taken depict an adult and two fluffy chicks, one in the nest and the other exploring the tree on foot and beak. This entry was posted in *DNCB, Bald Eagle, Brydon Lagoon, Great Horned Owl, Hi-Knoll Park, Northern Harrier, Red-tailed Hawk. Bookmark the permalink.